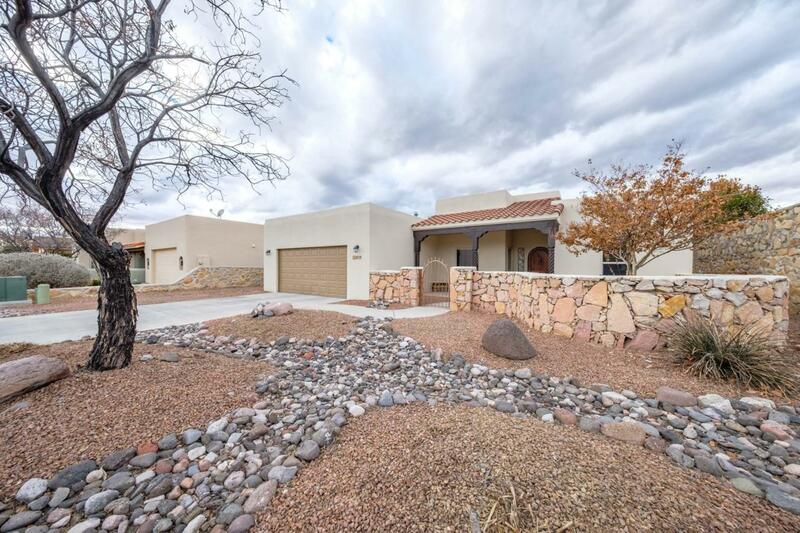 Come and see this beautiful southwestern home. As you walk in you entered into a spacious courtyard area, ideal for your morning coffee. This home offers a split floor plan with 3 bedrooms 2 bath, tile thru out the house, except carpet on bedrooms and living room. As you open this beautiful hand carved front door, you walk into a 12ft high ceiling living room with a wood burning, gas assist fire place. Gorgeous carved vigas in the dining room. Costume kitchen, granite counter tops thru out, all appliances convey, new dishwasher! Skylights in the kitchen and eating area and 2 in garage. Master suite offers full spa bath with double vanity sinks, jet tub, and walk in shower, separate commode, big walking closet. Nice size back yard ideal for entertaining or just relaxing. All this with low utilities bill, home has 4.335 kw of solar panels. Call for your personal showing today!